Tanah Merah has one of few quiet hidden shores tucked away from the hustle and bustle of urban pace. It is surprising to see how well the Ribbon seagrass (Cymodocea rotundata) has settled very well on this shore and is expanding its coverage area. The Ribbon seagrass on this shore is so thick that they form a thick seagrass carpet when the tide goes down has the strap-like grass blades fall and intertwined with each other. 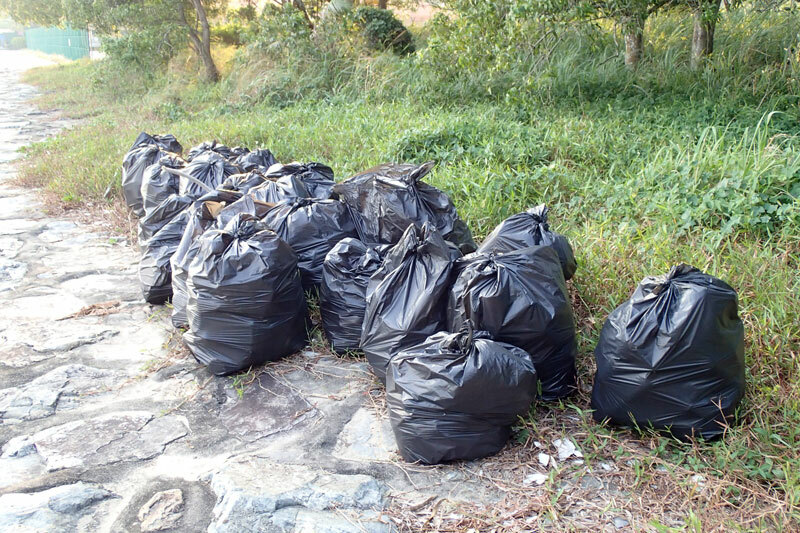 Before heading to the shore, we came across many filled black trash bags. 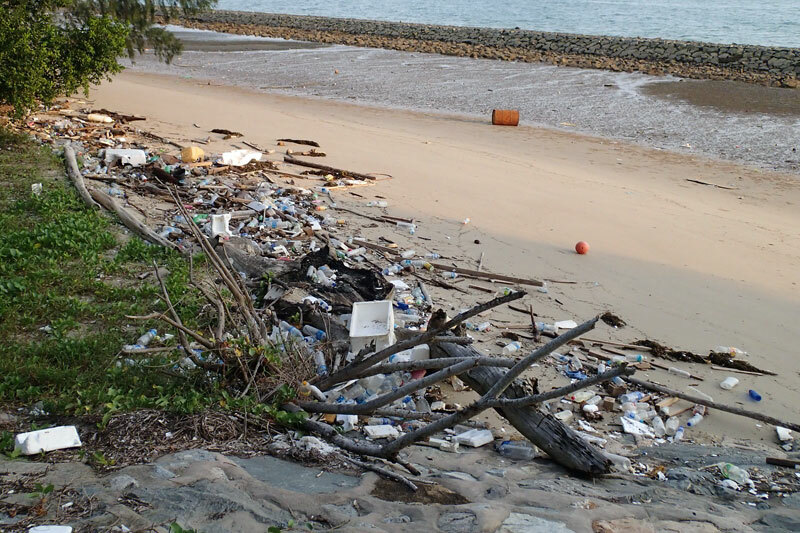 Seems like a group had cleaned up this shore as part of the International Coastal Cleanup Singapore (ICCS) event. 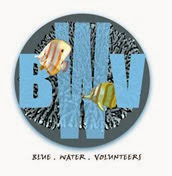 September is the month of international coastal cleanup and volunteers around the world spent the third Saturday of September cleaning up their coast. The site I visited today is Tanah Merah Site 7 and this site was cleaned up by ITE Colleage West (School of Engineering). 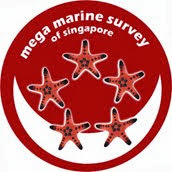 The data collected from this site can be viewed here. However there is an endless stream of marine trash brought in by the incoming tides each day and by the time we visited the shore after the cleanup event, we found more empty bottles washed up to the high water mark. Where did these trash come from? More trash along high water mark. As we moved down to the shore, we found more bits of trash scattered on the shore. Trash scattered on the shore. 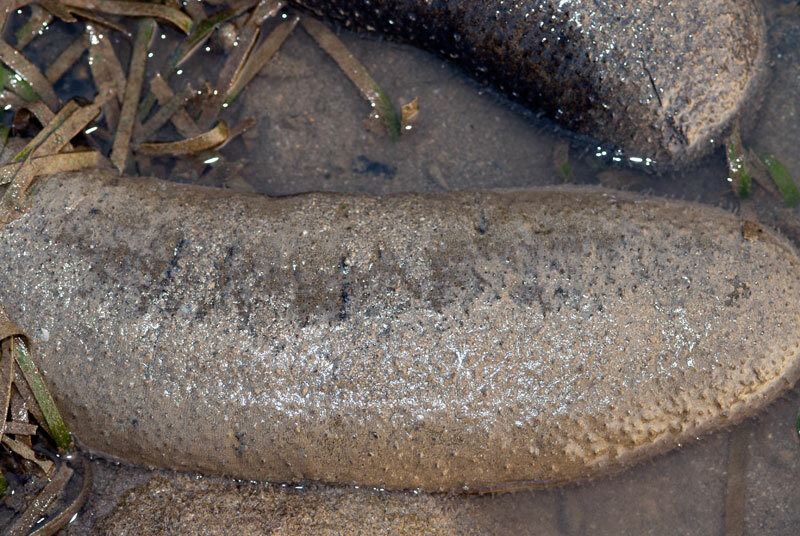 Right in front of the seagrass patch next to the seawall, Ria noticed a large Garlic bread sea cucumber (Holothuria scabra). 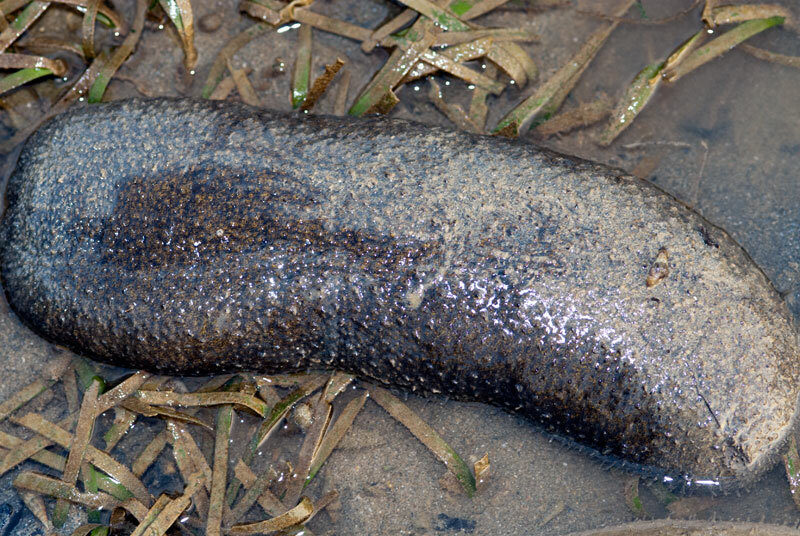 Garlic bread sea cucumber next to the seagrass patch. Shortly after, I found more of them nearby. 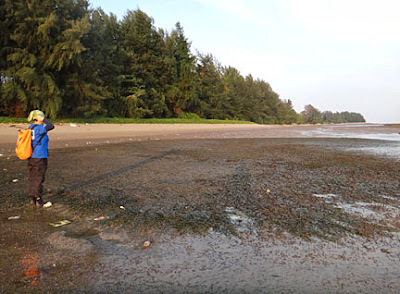 The Ribbon seagrass provided food and shelter for many tiny shelled animals. 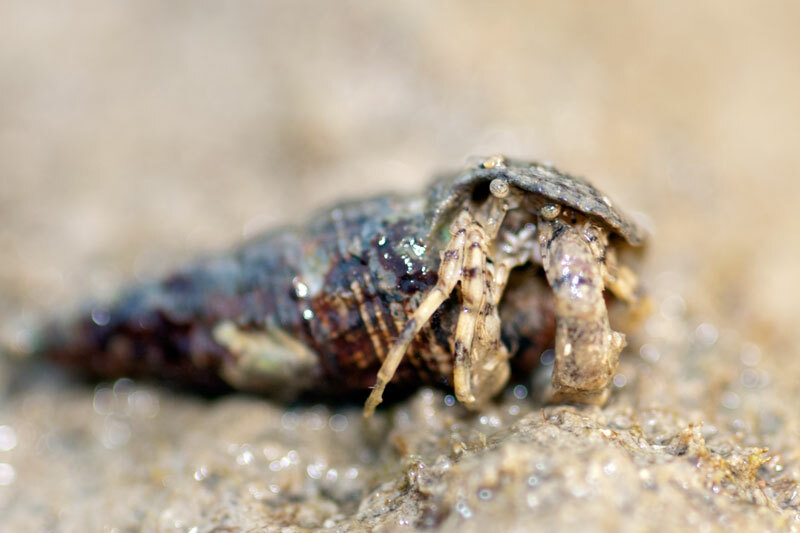 The tiny hermit crabs are so small and cute looking. The little blobs on the seagrass blades are actually the Dubious nerite snail (Clithon oualaniensis). 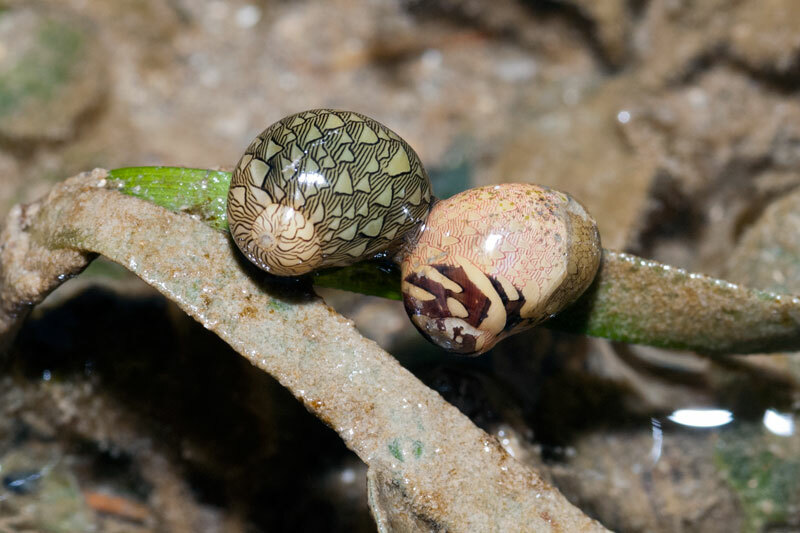 They may look like some boring tiny snails but on a closer look, these snail shells actually come in various patterns. We were treated with beautiful sunset on this quiet shore with ocassional sounds of plane taking off. As the sun begins to set, all the animals come out to play. There were plenty of fish and they were all swimming around me. 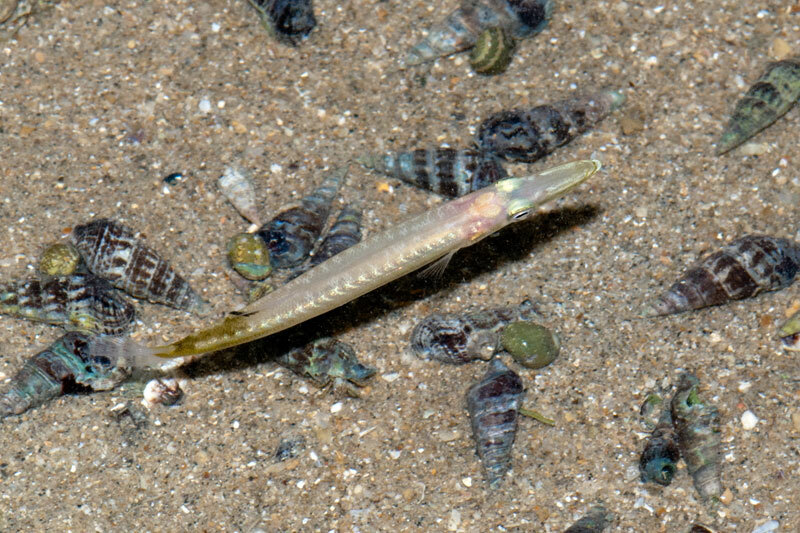 Night time is the best time to photograph fish as they are less active. 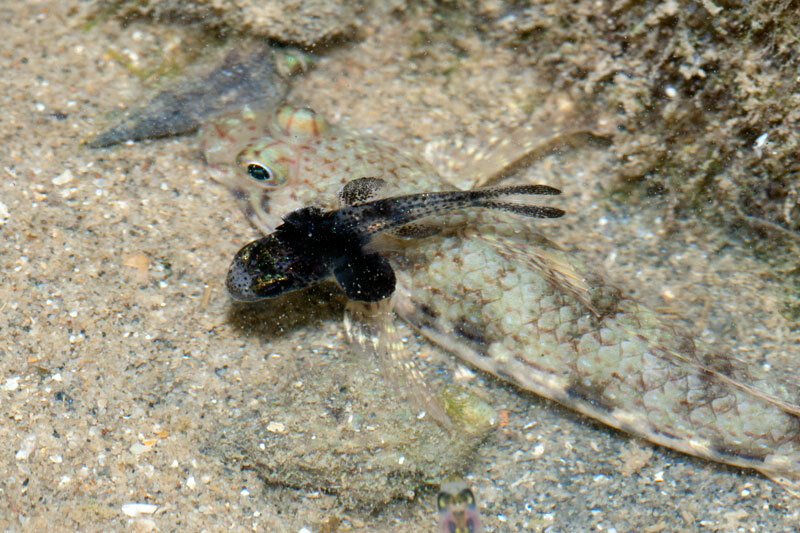 With more carefull observations, the Black cardinalfish (Apogon melas) actually starts appearing. On the surface the Broad-nose halfbeaks swim leisurely near me while a small juvenile Barracuda tried to avoid me in the shallow water. 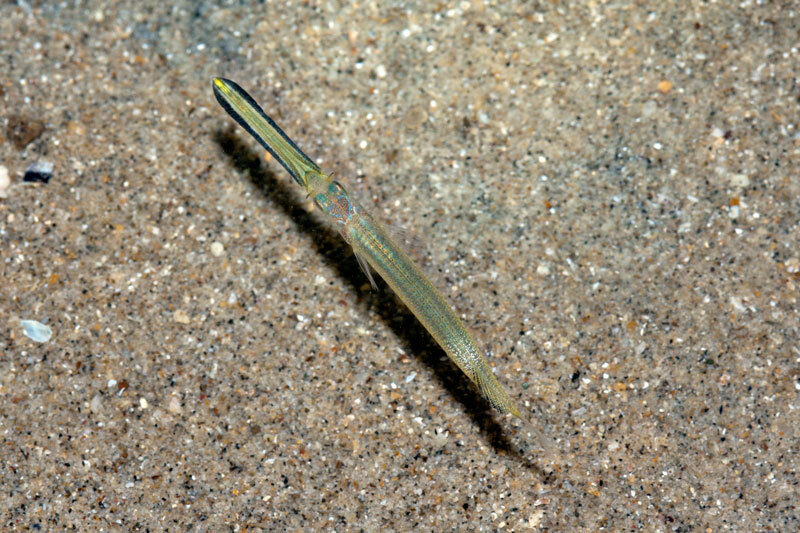 Another broad-nose halfbeak with different colour. 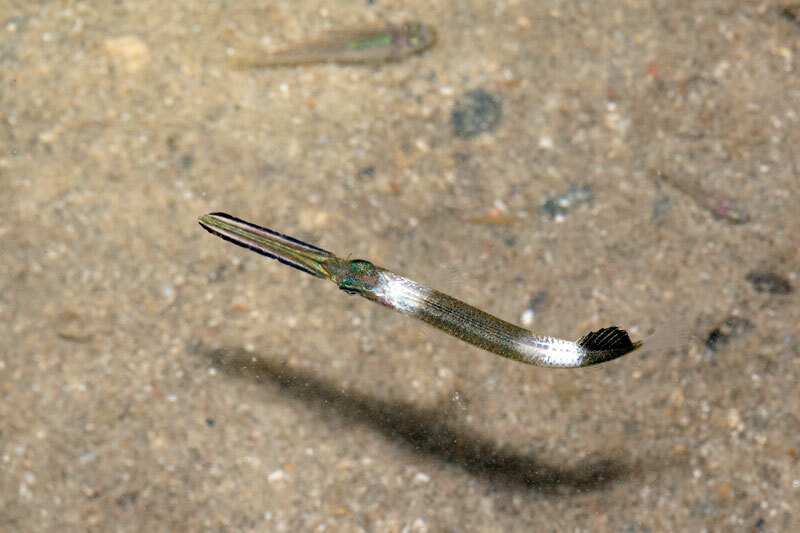 The small juvenile barracuda looks rather similar to the broad-nose halfbeak but it has larger eyes with the upper jaw only a little shorter than the lower jaw. 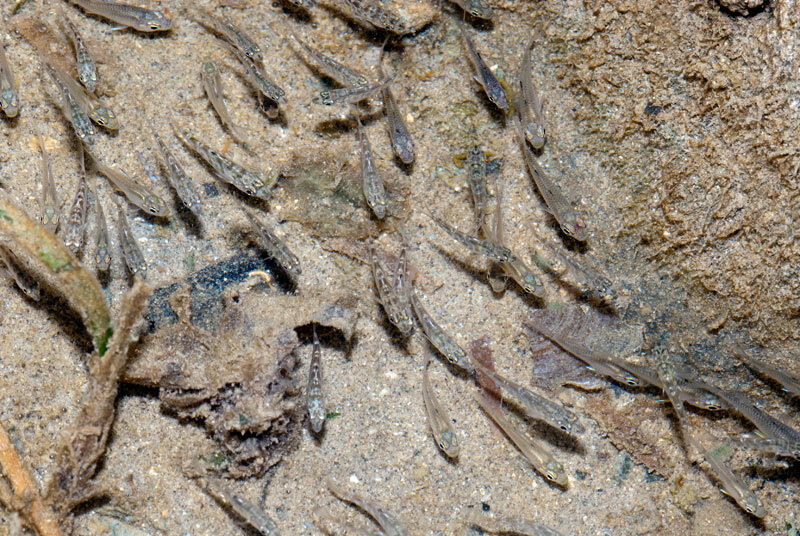 On the rocky seawall, there were different types of small shrimps moving around. I am not sure what these shrimps are. Some of them are very well camouflaged. Can you spot the shrimp? 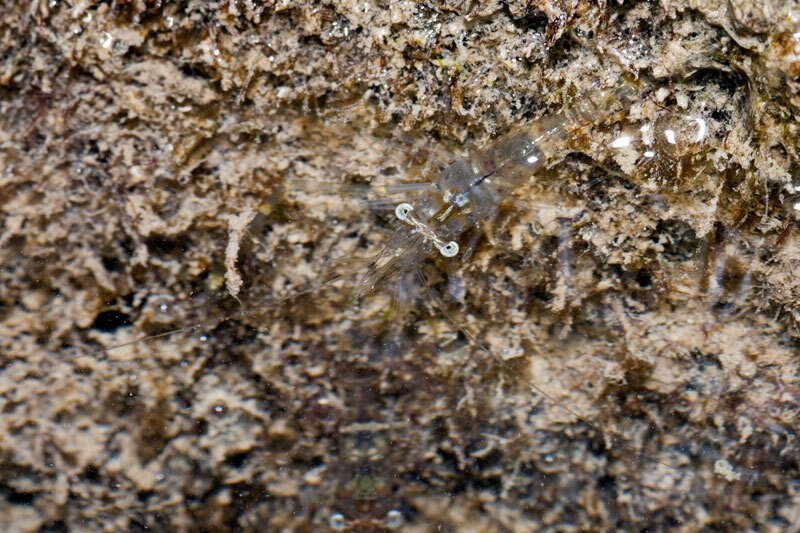 While on the sand, I spotted this unusual shrimp with a small band of red just behind its eyes. However the red band is not permanent. After handling the shrimp for a while, I noticed the red band fading away. How interesting! 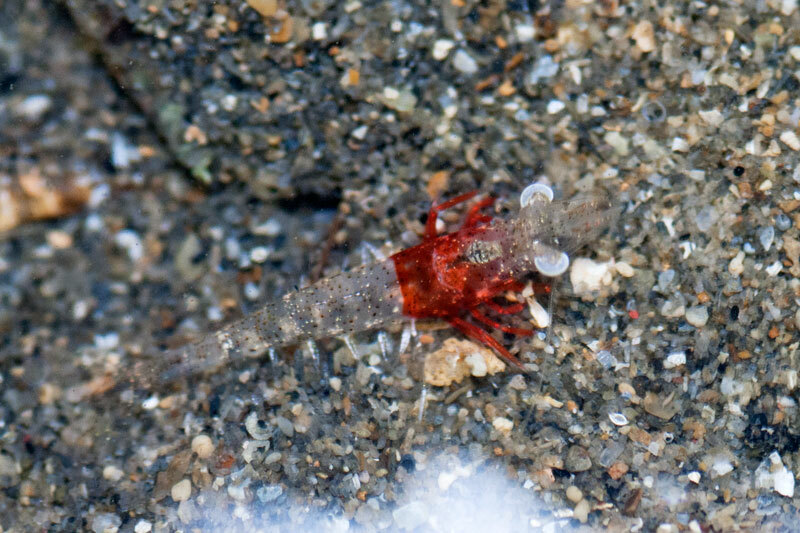 Unknown shrimp with interesting red band behind eyes. 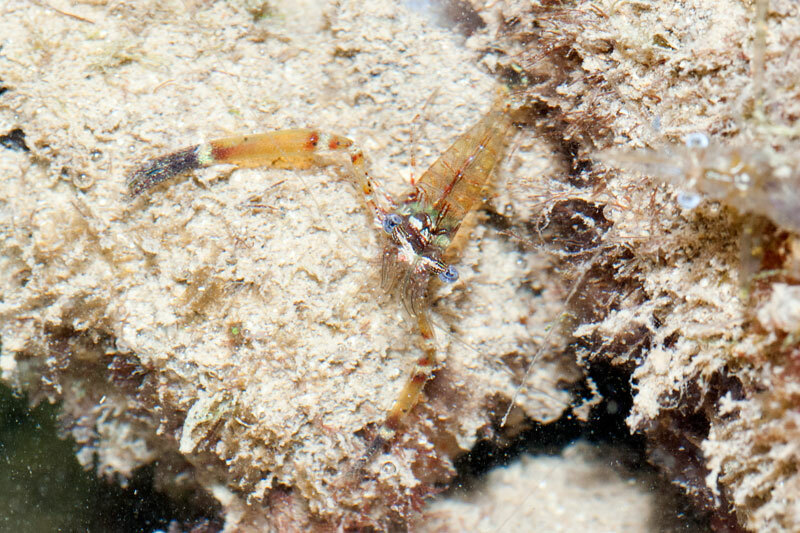 Ria mentioned that the Saron shrimp can be found at the rocky area along the seawall, but I had never seen a saron shrimp myself before so I was not able to spot any during this trip. After the trip, I learnt how to look out for them. Ria them showed me a Spotted orange hermit crab (Dardanus megistos). 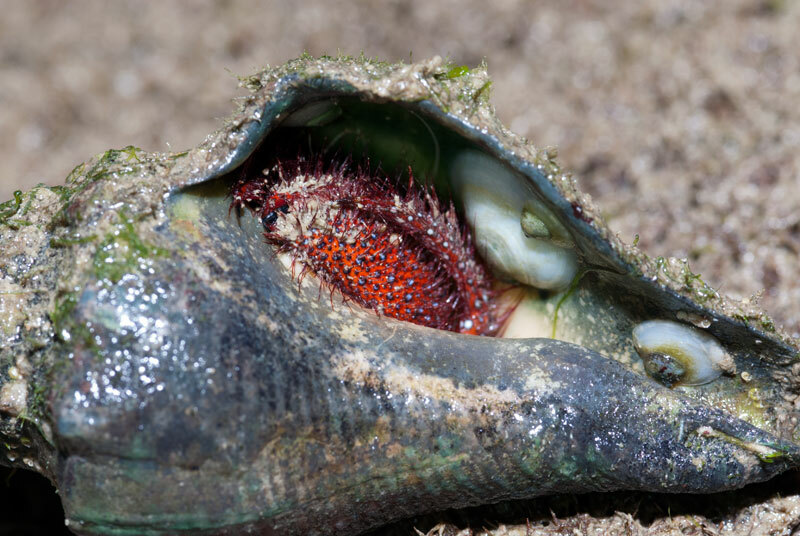 Unfortunately, the hermit crab got tired of emerging from its shell by the time it was shown to me. I only got an image of it hiding in its "home". 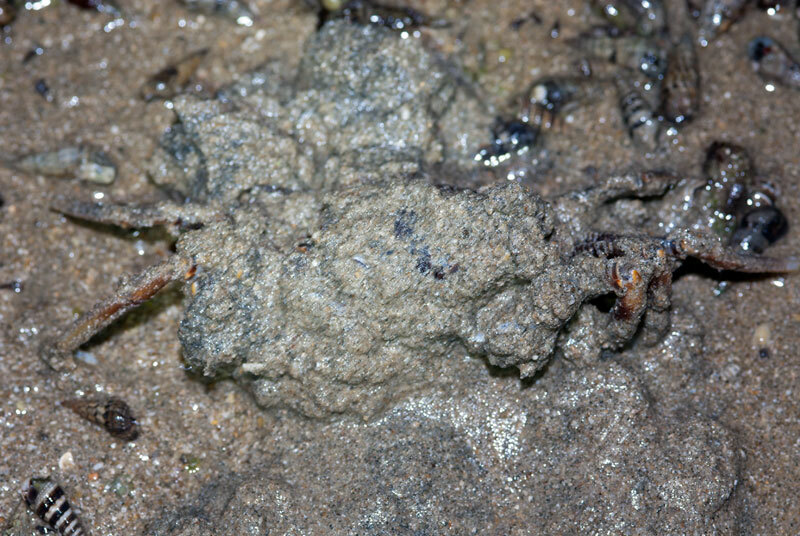 The highlight find for this trip would be a lonely Fiddler crab (Uca tetragonon) moving around the rocky area. 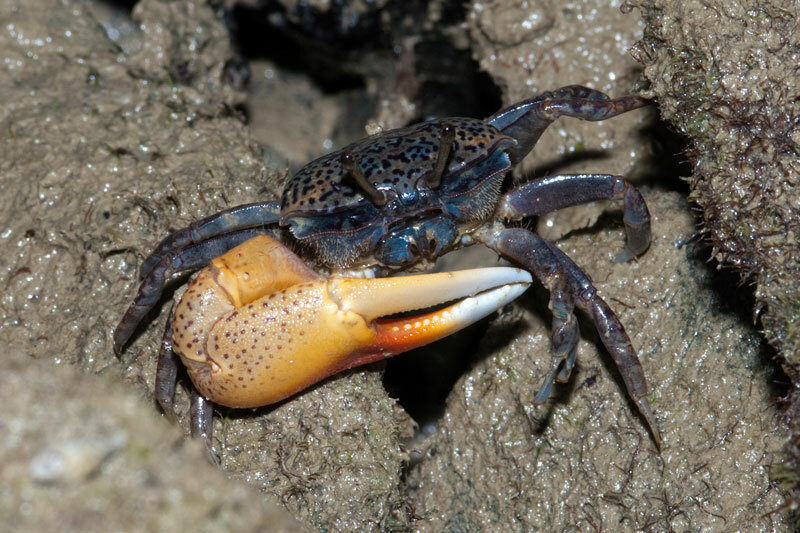 Thanks to Ivan Kwan, who alerted Ria that the fiddler crab might be similar to the one Kok Sheng saw at Sultan Shoal Lighthouse in 2008. Could there be more of this fiddler crabs that are hidding under the rocks? As we end the trip in darkness, the nocturnal hunting animals starts appearing. Can you guess what animal this is? 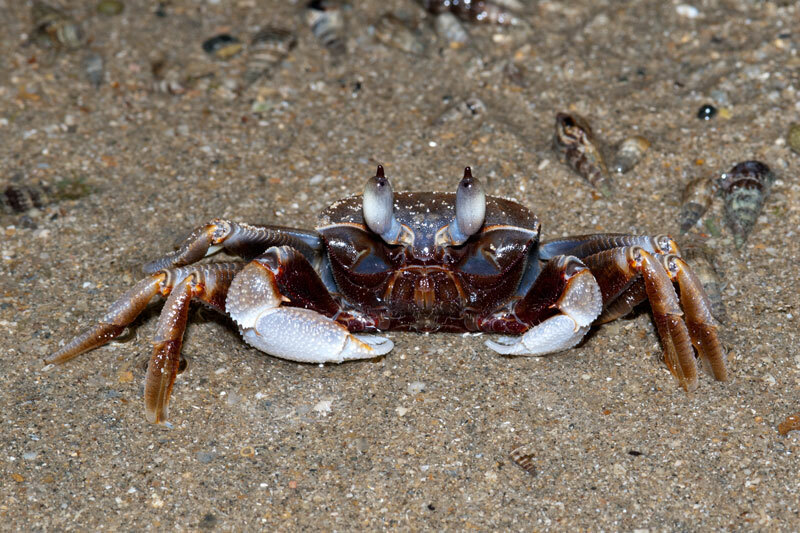 It is actually the Horn-eyed ghost crab (Ocypode ceratophthalmus) and they live in burrows near the high water mark. 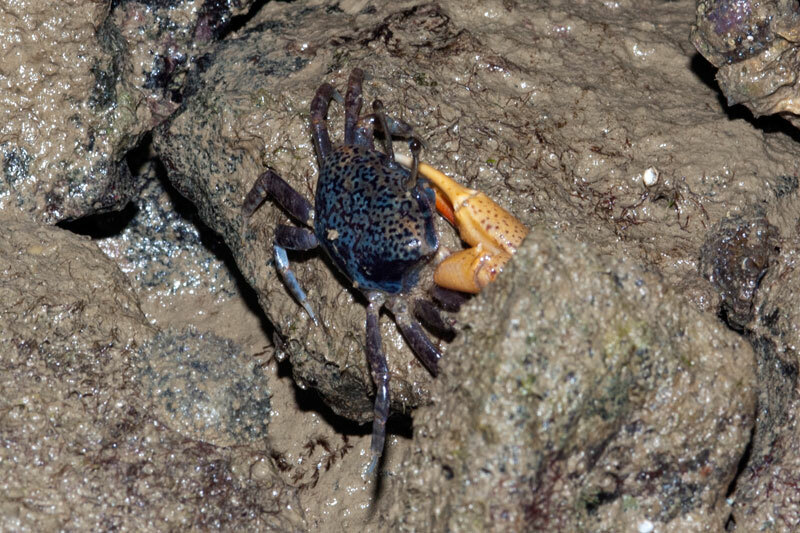 They are swift moving crabs, which gives them the name 'ghost crab'. I am a Horn-eye ghost crab. This may be my first survey trip at this shore but I am loving it at the animals that can be found here. For my next trip to this shore, I shall attempt to look for Saron shrimp myself! 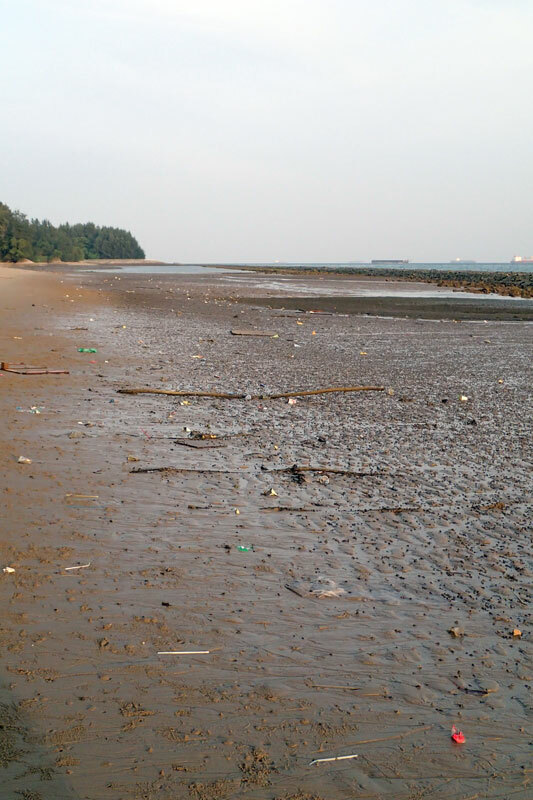 Running allowed at Chek Jawa?